These days, yoga is anything but boring. There are classes that teach handstands in hammocks and those that mix wheel pose with wine. And now, you can bend to the beat of a drum while surrounding yourself with beer. WASHINGTON — These days, yoga is anything but boring. There are classes that teach handstands in hammocks and those that mix wheel pose with wine. You can do bridges in a brewery or practice downward dog next to your own dog. And now, you can bend to the beat of a drum while surrounding yourself with beer. 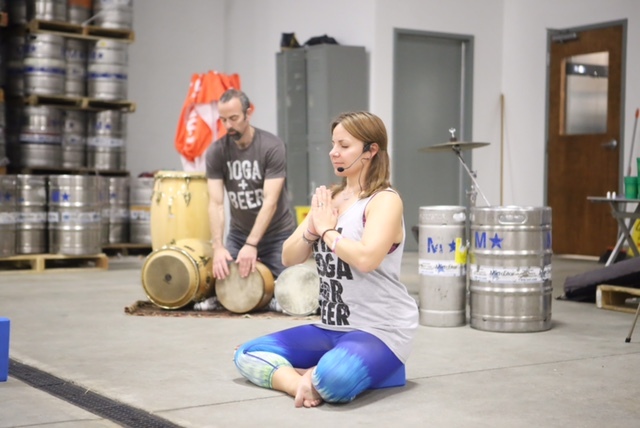 In February, Northern Virginia yoga instructor Erin Sonn and percussionist Brad Ellsworth are teaming up for an evening of live drumming and yoga at Arlington’s Sehkraft brewery. If it sounds gimmicky, it’s not. Sonn says the combo class is less about teaching what’s trendy and more about making yoga accessible to the masses. “I find that teaching traditional yoga in nontraditional places brings people to the mat who otherwise wouldn’t normally start a yoga practice,” said Sonn, founder of Eat. Yoga. Drink., a company that teaches yoga anywhere but in a classroom. “A lot of people come to the mat because of the lure of the drink or the lure of the entertainment. Some people are brought by their friends or spouses or partners. I’ve never seen anyone leave without a glow about them,” she added. Ellsworth adjusts his tempo to match the flow of the class. Higher energy poses are paired with more intense rhythms. As the class slows down, so does the drumming. Sonn says the blend of music and meditation helps her students to focus. “They’re using the rhythm to guide [their breath and movement] instead of singing along to a song they might recognize or being offended by a lyric,” she said. Sonn and Ellsworth will host two NamaSehkraft yoga and live drumming classes on Feb. 6 at 5:30 and 7:15 p.m. The cost, which includes a pint after class, is $20. Save 10 percent on admission when you use the code WTOP10 by Dec. 31 at checkout. Editor’s Note 1/17/2017: The Feb. 6 even has been moved to Mister Days in Clarendon. Tickets are available online.